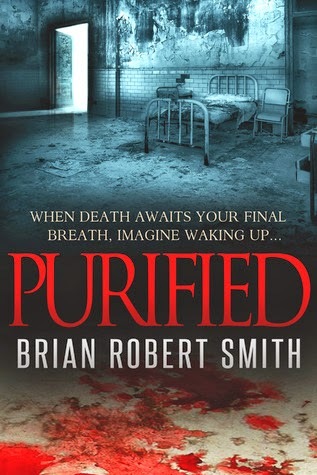 Summary: As far as everyone else is concerned, Mason Bushing died over a year ago, but now he’s running from Dr. Harlow who is secretly conducting an unauthorized experiment for a drug he calls Purify. It saved Mason’s life, but Mason is focused on getting what he wants most—his old life back. His plans change when he realizes his wife is more interested in the insurance money she inherited than seeing him alive. His best friend doesn’t believe his story, and the police intend on charging him with fraud and assault after he almost kills his wife’s boyfriend. Review: I was sent a copy of this book by the author in return for an honest review. What would you do if everyone thought you were dead, but the truth was, you'd been plucked from the jaws of death? What if it turned out you'd been saved for experimentation? How do you think the world would go on without you, while you were gone? All of these questions are faced by Mason, the hero of our story. Diagnosed with terminal cancer, Mason had expected to die but found himself saved for the experiments of a seemingly crazed doctor. You'd think that he'd be happy when he finally escapes, but not everything is as he expected it to be... Not only does he not get the welcome that he expects, but he's not exactly sure just what has been done to him during the experiments he endured. I think I would sum up this book by saying that it had an intriguing premise but failed a bit in terms of how it was executed. I was interested in the premise of this book, which is why I accepted the author's invitation to review it. Wanting to know more about Mason's situation and fate was what kept me reading - I mean after all, medical experimentation and conspiracies? That's something I'm always interested in. I sympathised with Mason, who has had the rug pulled out from under him and doesn't quite know where to turn, or what to think. The first part of the book is very much about him finding out that his return to society and his former life isn't going to go as smoothly as he thought. I think this book would have benefited highly from some crisper editing, however. Some parts of the book are very choppy, such as the first chapter - there's no flow, simply '____ did this. _____ did that.' Short sentences break up the text during the action and make it hard to get caught up in what's going on. Sometimes that is an asset to writing and used to make a point, but in this case it was distracting. It made it difficult to get into the book, and it wasn't until we picked up with Mason's POV that it started to flow more. Some parts of the book lagged a little, as well. Stuff was going on that I should have been more interested in, but I did find myself impatient for things to pick up and move along - I wanted resolution, and unfortunately, the ending is a bit vague and doesn't really provide it. I think more delving into the motivations of some of the characters and why they were involved in this would have done more to the book's benefit. Some of the character felt very one note - bad guy muscle, deranged doctor, slightly dumb cop, etc. More depth of characterization would have done a lot to make me relate a bit more to the book. I'd say that overall this is a fair debut, and I'd be interested to check out this author again as his writing develops.